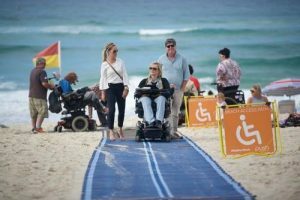 Accessible Beaches Australia and partner Push Mobility are pleased to announce their first accessible beach event in South Australia at Henley Beach! They’ll be rolling out the Mobi-Mat, the Lasher Sport BT Beach Wheelchair (self-propelled) and the Mobi-Chair Floating Wheelchair for all of you to come and try! High tide is at 9am, so be sure to arrive early if you can!